Remember that review SMC’s Jason Newcomb did of this book early last year? How about the podcast interview with Jason Shiga himself, the man behind this intricate creation? Well, that fine piece of work led me to go out and purchase the book. Despite the difficulty I had in finding a copy to purchase locally I patiently ordered it through my local comic book store. MAN was it worth it! 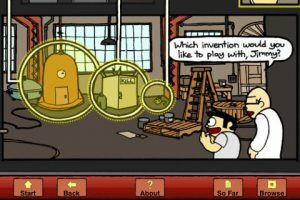 A graphic novel, choose your own adventure, and puzzle all-in-one. I have gotten my money’s worth and then some! Between the hours I have spent making my way through it, multiple times I might add, others curious about the content have also browsed through the book as it sat in plain sight at my house all those weeks that I couldn’t put it down. It was recently brought to my attention that an App now exists that brings Meanwhile to digital life. Not only is it so easily available (I live in a large city and could not find a physical copy without ordering it from my local comic book store), but it is considerably cheaper ($4.99) compared to the physical copy ($15.95 cover price). The App version of Meanwhile lays out all the panels from the book in one large free range map. This takes the work out of having to follow the lines and turning the pages back and forth that you would be faced with had you bought a hard copy. The App includes the ability to simply tap on panels to move through the path that you choose. 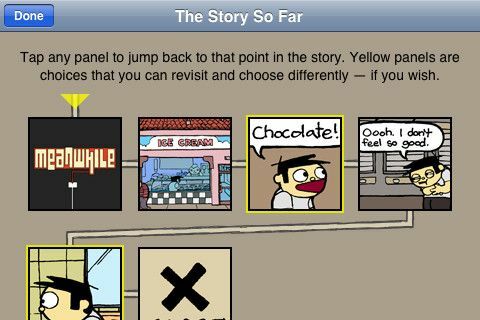 You can also use tools to view the history of your story so far, or rewind to backtrack if you wish. When reading about the App in the App Store I noticed that there was a voice command option available, but I couldn’t figure out how to use it, but this may be due to the fact that I was using a free trial version. By itself the app is pretty sweet. No bugs or glitches, and makes it easy to carry along and do anywhere of course. Having experienced the physical version of this book, I would say that the app pales in comparison. I love the book and the adventure in following the lines, turning the pages, and the whole mechanics of how it works so brilliantly on paper. The app still shows some of that intricacy, but it is a shadow of what the book does. If you’re cash strapped, always on the go, and looking for a really sweet comic book app, then buy this book in digital form. If you want to be completely immersed in the whole experience and own a physical copy of this masterpiece, then buy a copy of the book. You won’t be disappointed! For a bigger glimpse into what Meanwhile is all about visit this link for an interactive version that includes early artwork! I also note that I have an update coming out soon which includes a higher-resolution version of Jason’s artwork. It’s in App Store review now, so it should be out next week. Love the book, app seems great! Awesome Andrew thanks for the additional info! For some reason I couldn’t find a “how to” for the voice command. I’ll check it out! Great work!